The apothecary is conveniently located at the intersection of Northeast 1st Ave. and 4th St., just off Parkway, in Battle Ground Washington. From Main St., turn north on Parkway, then take the second right, past Tiger Bowl. We're on the corner of NE 1st Ave. and NE 4th St.
Battle Ground Apothecary is proud to stock the largest selection of essential oils in the area. Apothecary proprietor Diana Davidson is now a Doterra Wellness Advocate. 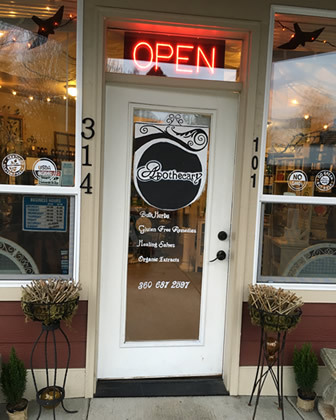 Due to the owner's decision to retire, Battle Ground Apothecary is for sale! While we will miss our loyal and supportive customers, we look forward to a new chapter in our lives. Please note that we are not closing! We will continue to operate the Apothecary until we find the right buyer. For more information, please click here. Denise Hays, one of Battle Ground's best nutritionists, is on board for advice and information on Thursdays. We all need to be accountable for our health, especially nowadays with our health care system so iffy. We want to arm you with the knowledge of how and why to make food your medicine. 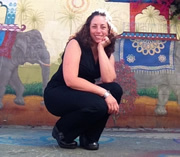 Denise is also a personal trainer affiliated with Snap Fitness. Karen Yanhs-Anderson, CEO of Photon Herbal Pets and inventor of Tumorid topical salve is available for discussions most Wednesday afternoons. Tumorid can help your pets to eliminate abnormal skin growth (tumors, warts, skin tags) using alternative methods instead of surgery. We are currently providing free samples at the apothecary while supplies last, and expect to be a dealer for Photon products in the near future. Dr. David Young, ND is a primary care Naturopathic Doctor, licensed in Oregon and Washington. 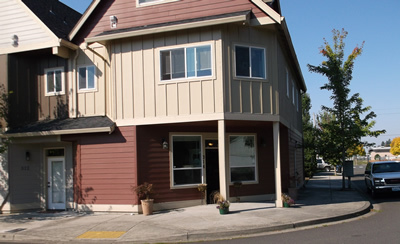 His office is located at 318 E. Main St. in Battle Ground, WA. Phone: (360) 687-3340 Office hours Mon, Weds, and Thurs • 9AM to 5PM. Laurie Solomon, L.Ac./EAMP operates Starfire Herbs and Acupuncture at 304 S. Parkway Ave in Battle Ground. Her office hours are Tues, Wed, Fri and Saturday, by appointment. The Battle Ground Apothecary & Natural Goods Store is your preferred earth-friendly source for supplements, herbal teas, bulk herbs, aromatherapy, homeopathic remedies, our own Wise Gals line of skin care products, gifts, assorted treasures, and much more! Click on the photo at the left for a tour of the store, or this link to our product page. We also sponsor classes on many topics related to natural health, please check our Events page for more information. Contact us for information, to leave a presciption or place an order. We are proud to be a member of the Holistic Chamber of Commerce. 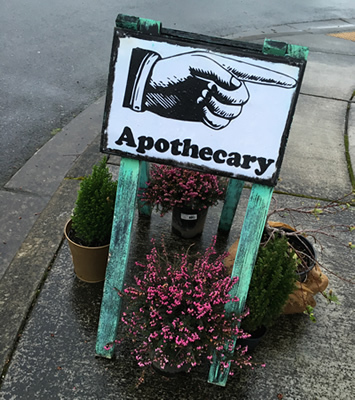 Follow these signs to the Apothecary! Please check out our Newsletter, which has many new items of interest. Our recipes section now includes a page with our favorite dandelion recipes. Take a look at our Folklore page for fun and interesting herb facts and legends. The Chronicles of Mugwort, by Louise Harmon can be found here as well. Enjoy! !